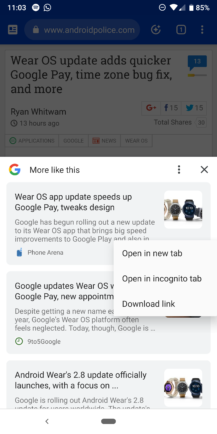 It's no secret that Google wants you to browse more and read more — this is a surefire way to see more ads from its network. 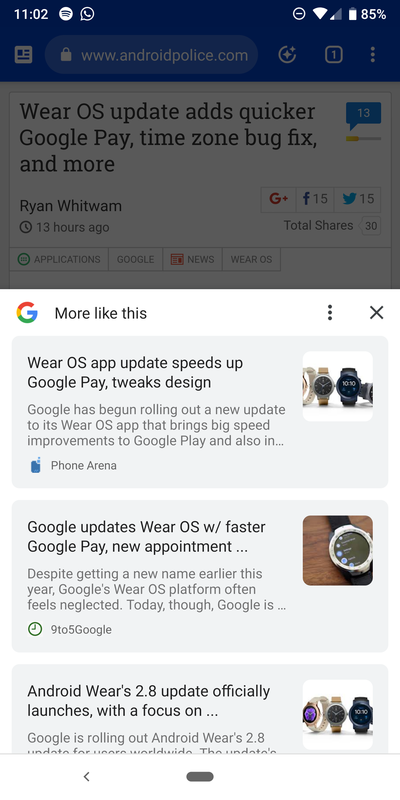 Over the past months, we've seen suggested articles pop up everywhere in the Google Feed, Google News, Chrome's new tab page, and sometimes even when searching for something. 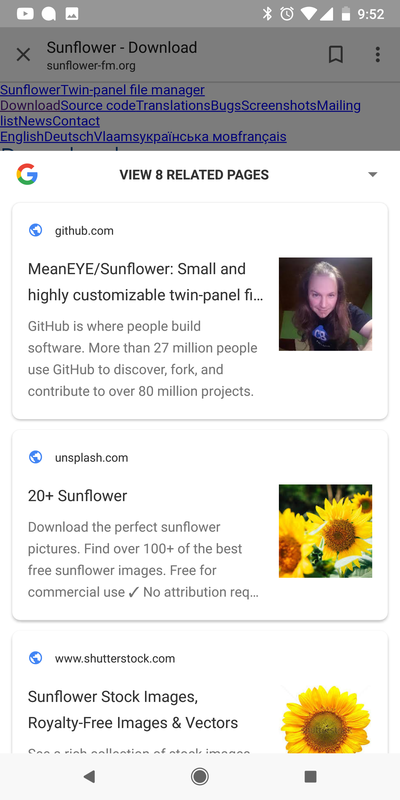 You may remember a "People also view" sliding card that showed up when you were viewing a page from Google Search results. That card evolved over time into "View x related pages," and has now started showing up in Chrome as "More like this." The evolution of related pages from "People also view" (left) to "View x related pages" (middle), both in Custom Tabs after a Google search, then "More like this" (right) in Chrome. 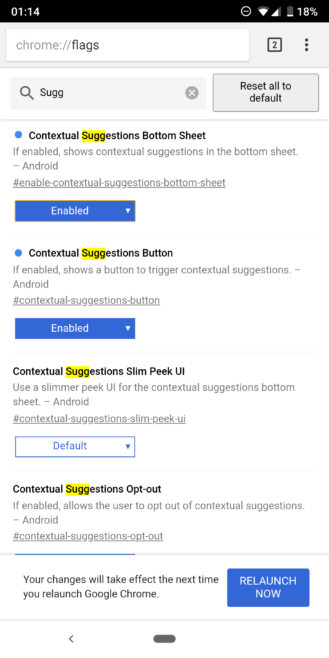 A new button appears next to the address bar when you're reading an article that Google has indexed similar stories to. Tap it and the "More like this" sheet springs up from the bottom with several articles from various sources discussing the same story. You can expand it to view all the cards, tap on one to open it, or tap and hold to send it to a new tab, an incognito tab, or download it. Left: "More like this" button in the top bar. Middle: bottom sheet + options. Right: sheet expanded. 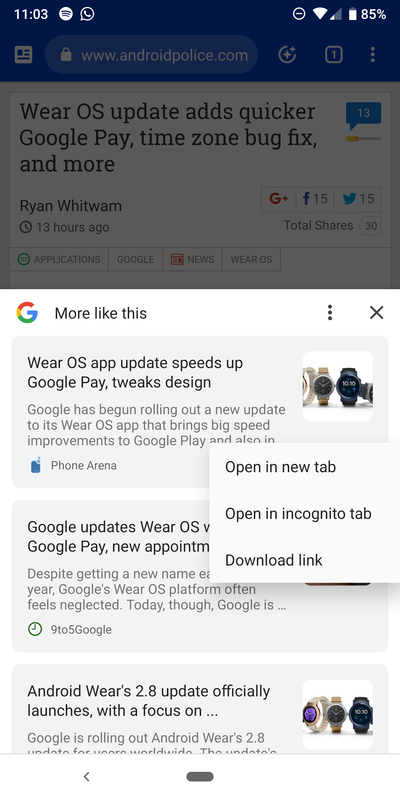 The button started showing up in Chrome Canary v70 (APK Mirror) for some users, but it can be enabled from the flags. There's a series of "Contextual Suggestions" flags in Canary, and turning on the chrome://flags/#enable-contextual-suggestions-bottom-sheet and chrome://flags/#enable-contextual-suggestions-button at the same time seems to do the trick for me. I couldn't get the Slim Peek UI one to do anything. If you're on Chrome stable, only two flags are there, and notably missing is the button flag. The bottom sheet one doesn't seem to work on its own. 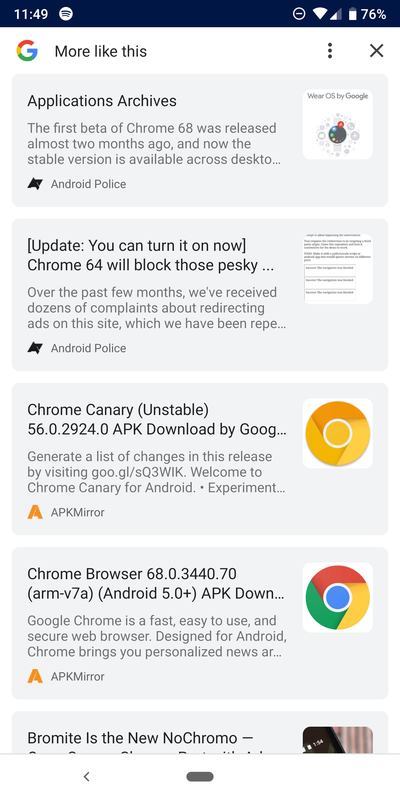 Chrome Canary v70's contextual suggestions flags. I don't see myself using this feature a lot when reading regular tech news, but when exploring a story that might have more layers and nuances, this button could help me immediately access other coverage around the web and see different points of views and various takes. 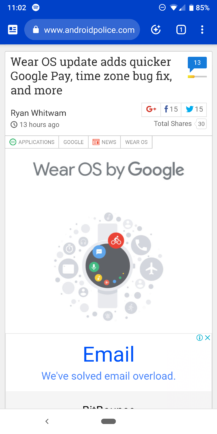 The idea is similar to Google News, but it works for any article I may be viewing, not just what's already in my news feed. I have to say I like the idea, but the Chrome top bar is getting too crowded. 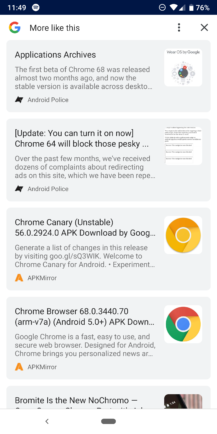 If you want to see for yourself, grab the latest Chrome Canary from the Play Store or from APK Mirror, and enable the two flags mentioned above.